In early 2013, Prof Phil Hugenholtz, Director of the Australian Centre of Ecogenomics delivered an inspiring lecture on the application of differential coverage binning to produce near-complete genomes from metagenome data 1. We both had had a major interest in novel phyla and given my team recently discovered a potential biodiversity ‘hotspot’ in an underexplored region of east Antarctica 2,3, we began a new collaboration aimed at obtaining genomes of candidate phyla WPS-2 and AD3 from one of the sites, Robinson Ridge. The goal was to understand why members of these rare phyla were thriving in east Antarctic desert soils. That was the beginning of what is now fruitful collaboration. My PhD student at the time Mukan Ji was given the goal of elucidating the metabolic potential of not only the draft genomes recovered, but also the Robinson Ridge ecosystem as a whole. What we found was intriguing and through some passionate detective work, including the search for like-minded scientists, we developed an exciting hypothesis that took three intense years to validate. Belinda Ferrari’s Research Group. Back Left to Right: Dr Mukan Ji, Eden Zhang, Angelique Ray, Catharina Vendl, Dr Josie van Dorst. 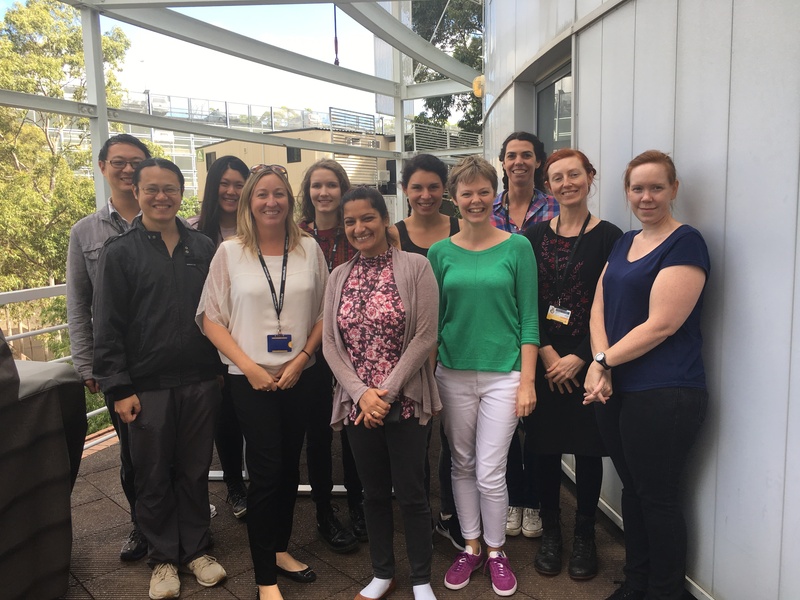 Front Left to Right: Chengdong Zhang, Associate Professor Belinda Ferrari, Sarita Pudasaini, Sally Crane, Nicole Benaud and Kate Montgomery. We found that many of the draft genomes contained putative high-affinity hydrogenases 4,5. As serendipity often contributes to science, recent PhD graduate Dr Chris Greening had just revealed that bacteria use these enzymes to scavenge hydrogen gas from the atmosphere, thus providing the maintenance energy required to survive dormancy 6,7. I thought it make sense that this process would also operate in Antarctica, given bacteria living there must survive long periods of starvation under extremely harsh conditions 8. I looked even closer and noticed that a newly identified chemosynthetic lineage of RuBisCO 9, known as IE, was also widespread, with almost negligible levels of phototrophic genes detected in the entire metagenome. Our resulting theory was that microbes in Antarctic deserts were not only using trace gases to survive extended periods of dormancy, but they were using the energy produced to fuel the CBB cycle and fix carbon. Were the phyla with this genetic capacity actually the primary producers of the ecosystem? More importantly, being an environmental microbiologist with little biochemistry background, how do I prove it? Well you contact the scientists at the forefront of hydrogen metabolism research and hope they also think you are onto something exciting. As luck would have it, Chris Greening had just taken up a lectureship at Monash University in Melbourne and he flew straight to Sydney. The team we then established to validate our hypothesis were passionate, easy to work with and brilliant…. The metagenome data that Belinda and Phil sent over was phenomenal. All 22 reconstructed bacterial genomes from Robinson Ridge harbored genes for oxidation of the atmospheric trace gases hydrogen, carbon monoxide and methane. In some of these genomes, including those from the two candidate phyla, these genes co-occurred with the carbon dioxide-fixing enzyme RuBisCO. We constructed phylogenetic trees based on this data and confirmed all the hydrogenases detected were putative high-affinity ones (group 1h) and the RuBisCO enzymes belonged to known chemosynthetic lineages (type IE). It was evident that these Antarctic communities were probably energized by trace gases, just as we had previously predicted. But even more excitingly, they apparently could use these gases to fix carbon too. Chris Greening’s Research Group. 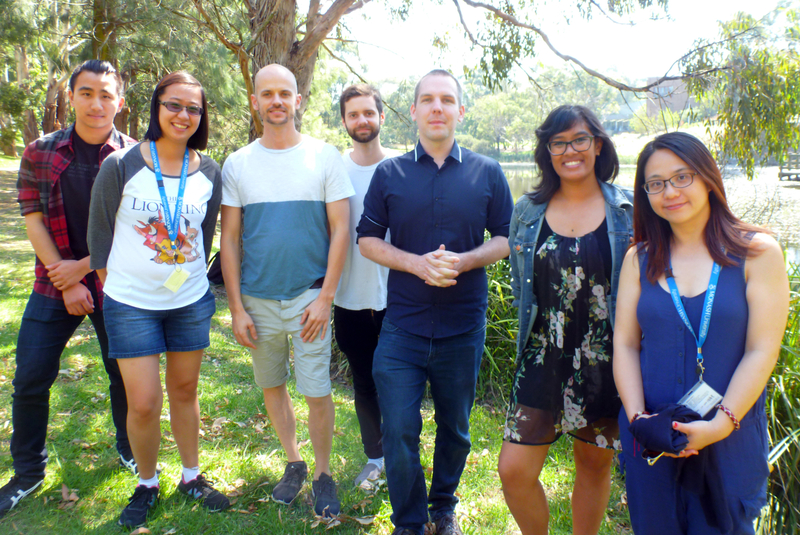 Left to Right: Thanavit Jirapanjawat, Joanna Feng, Sean Bay, Blair Ney, Dr Chris Greening, Zahra Islam, Ya-Jou Chen. Absent from photo: Paul Cordero. At this stage, Belinda and I realized we might have a real shot with Nature. These results potentially explained why Antarctica can support much richer microbial communities than would be expected. However, the inner biochemist in me was nervous about making too many conclusions based on sequencing data alone. If atmospheric trace gases really are the primary energy source for these soils, we needed to measure their consumption. The gas chromatography experiments, conducted by Dr Carlo Carere and Dr Matthew Stott in GNS Science, showed the soils oxidized hydrogen at very fast rates. The level of activity observed astonishing all of us – let’s not forget that these samples came from a continent that was thought to be “basically sterile” for much of the 19th century. We also conducted a carbon fixation study, together with esteemed algal physiologist Prof John Beardall shortly before his retirement, that validated hydrogen stimulates carbon fixation by these soil communities. While my involvement in this paper only stretched eighteen months, it is a culmination of seven years of scientific exploration that began with my PhD under the incredible supervision of Prof Gregory Cook. My research then was all about how pure cultures of mycobacteria survive nutrient starvation in their notorious persistent states. This new research aimed to understand how such rich communities exist in some of the most nutrient-starved ecosystems of all. The mycobacterial physiology and Antarctic microbial ecology fields couldn’t be much further apart within the wider of discipline of microbiology. However, it turns out that atmospheric hydrogen was a missing part of the puzzle for both of them. With our publication now out, I’m looking forward to collaborating further with Belinda and other members of the team to discover more about primary production in these ecosystems. 1. Albertsen, M. et al. Genome sequences of rare, uncultured bacteria obtained by differential coverage binning of multiple metagenomes. Nat Biotech 31, 533–538 (2013). 2. Ji, M. et al. Microbial diversity at Mitchell Peninsula, Eastern Antarctica: a potential biodiversity ‘hotspot’. Polar Biol. 1–13 (2015). 3. Ferrari, B. C. et al. Geological connectivity drives microbial community structure and connectivity in polar, terrestrial ecosystems. Environ. Microbiol. 18, 1834–1849 (2016). 4. Greening, C., Berney, M., Hards, K., Cook, G. M. & Conrad, R. A soil actinobacterium scavenges atmospheric H2 using two membrane-associated, oxygen-dependent [NiFe] hydrogenases. Proc. Natl. Acad. Sci. U. S. A. 111, 4257–4261 (2014). 5. Constant, P., Chowdhury, S. P., Pratscher, J. & Conrad, R. Streptomycetes contributing to atmospheric molecular hydrogen soil uptake are widespread and encode a putative high-affinity [NiFe]-hydrogenase. Environ. Microbiol. 12, 821–829 (2010). 6. Greening, C. et al. Persistence of the dominant soil phylum Acidobacteria by trace gas scavenging. Proc. Natl. Acad. Sci. 112, 10497–10502 (2015). 7. Greening, C., Villas-Bôas, S. G., Robson, J. R., Berney, M. & Cook, G. M. The growth and survival of Mycobacterium smegmatis is enhanced by co-metabolism of atmospheric H2. PLoS One 9, e103034 (2014). 8. Cary, S. C., McDonald, I. R., Barrett, J. E. & Cowan, D. A. On the rocks: the microbiology of Antarctic Dry Valley soils. Nat. Rev. Microbiol. 8, 129–138 (2010). 9. Grostern, A. & Alvarez-Cohen, L. RubisCO-based CO2 fixation and C1 metabolism in the actinobacterium Pseudonocardia dioxanivorans CB1190. Environ. Microbiol. 15, 3040–3053 (2013). 10. Berney, M., Greening, C., Conrad, R., Jacobs, W. R. & Cook, G. M. An obligately aerobic soil bacterium activates fermentative hydrogen production to survive reductive stress during hypoxia. Proc. Natl. Acad. Sci. U. S. A. 111, 11479–11484 (2014). 11. Greening, C. et al. Genomic and metagenomic surveys of hydrogenase diversity indicate H2 is a widely-utilised energy source for microbial growth and survival. ISME J. 10, 761–777 (2016). 12. Constant, P., Chowdhury, S. P., Hesse, L., Pratscher, J. & Conrad, R. Genome data mining and soil survey for the novel Group 5 [NiFe]-hydrogenase to explore the diversity and ecological importance of presumptive high-affinity H2-oxidizing bacteria. Appl. Environ. Microbiol. 77, 6027–6035 (2011). 13. Khdhiri, M. et al. Soil carbon content and relative abundance of high affinity H2-oxidizing bacteria predict atmospheric H2 soil uptake activity better than soil microbial community composition. Soil Biol. Biochem. 85, 1–9 (2015). 14. Lynch, R. C., Darcy, J. L., Kane, N. C., Nemergut, D. R. & Schmidt, S. K. Metagenomic evidence for metabolism of trace atmospheric gases by high-elevation desert Actinobacteria. Front. Microbiol. 5, 698 (2014). 15. Greening, C. et al. Atmospheric hydrogen scavenging: from enzymes to ecosystems. Appl. Environ. Microbiol. 81, 1190–1199 (2015). Interesting to hear about the collaborative effort behind this paper, thanks for sharing!